Soo…..We have some exciting news aboard Idyll Time. 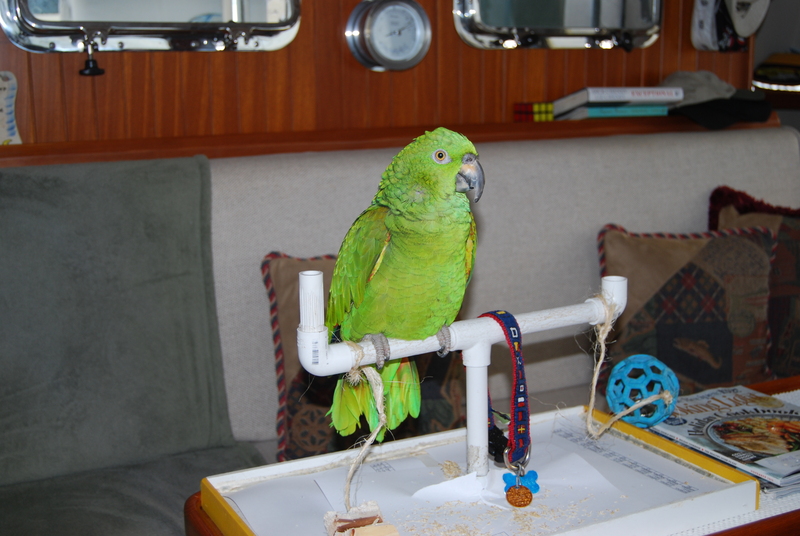 For those of you that follow our blog you will ember our fiasco with trying to take Nate, our Amazon Parrot, with us to the Bahamas earlier this year. (see A Birds Tale) Well, sometimes things happen that you had never expected. I am sure everyone has had something happen to them that just seemed meant to be. It seems that our recent events with Nate were just such. Someone up above seemed to be guiding us. To give you more of an understanding, you need to know our history with Nate. Susie has owned Nate since he was a year old. He is now 38 and has only been separated from her when we would take short vacations. Homer was Jeff’s Amazon parrot. We we got married 28 years ago the two birds became brothers and best friends. Homer passed away about a year ago at age 58 and Nate has missed him dearly. Remember, they were together for 27 years. When we purchased our boat 10 years ago, our Krogen salesperson, Bill Harris, took us to Birds on Safari here in Stuart. He knew we had birds and thought we would enjoy seeing this wonderful bird only pet store. 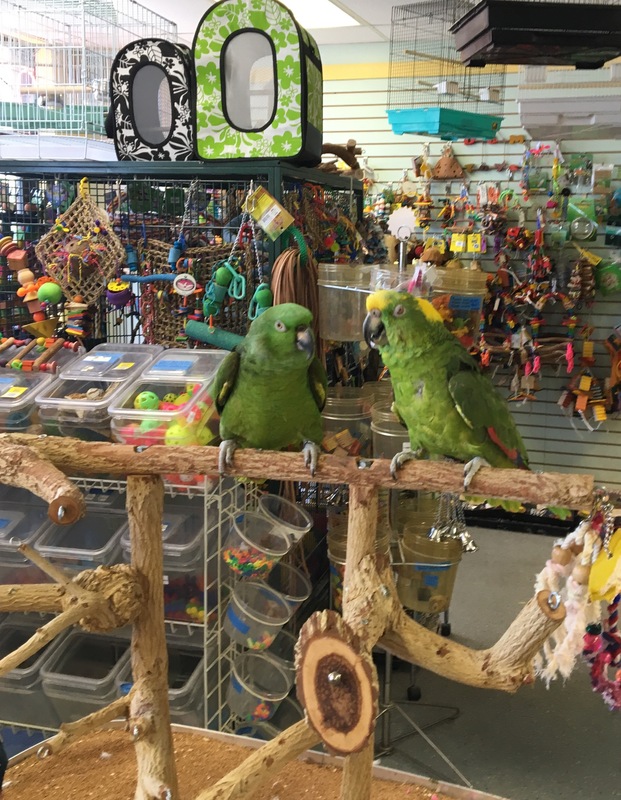 They raise birds at their home and also board birds at the store. Fast forward to this March while we are in Marathon.… we get a phone call from Dana, the owner of Birds on Safari. She knew that we had lost Homer last year and was asking if we would be interested in adopting another 38 year old Amazon. 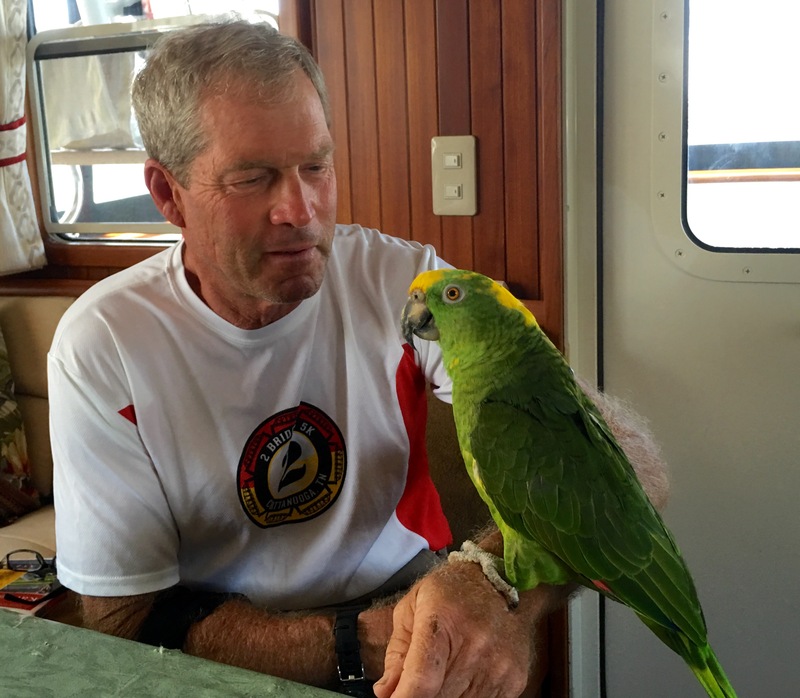 We had no intention of getting another bird and were getting ready to leave for the Bahamas for several months so we declined the offer. Three days later we learn of the difficulties in taking Nate with us to the Bahamas. A really difficult decision was made to board Nate at Birds on Safari for the Next two months. Walking into the boarding room with Nate, we see Primo, the 38 year old rescue Amazon for the first time. Nate’s temporary home just happens to be right beside Primo. As soon as Primo sees Nate, he is reaching his foot through the cage bars towards Nate and Nate eases over towards Primo. Things seem to be off to a good start and we are happy that Nate will have a companion while we are away. While in the Bahamas, we call each week to see how Nate is doing. 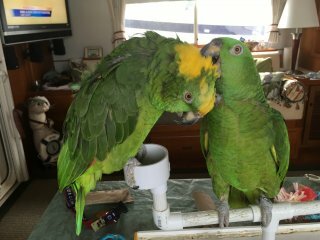 The first reports were that Nate and Primo were sitting as close together as possible, separated only by the cage bars. 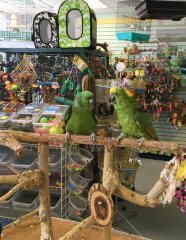 The staff at the bird store would bring Nate and Primo out on T- stands each day in the store. Primo would get really upset if they took Nate back to his cage before Primo. They eventually started putting the two together on the same perch. The two birds became inseparable during their two month stay. So…when we returned, both Primo and Nate came with us back to the boat. How could we not adopt Primo. His owner, a 95 year old man, had just passed away. Both Primo and Nate were lonesome and are now best friends. I don’t think the humans had a say in this matter. This entry was posted on June 8, 2016 at 6:22 pm. You can follow any responses to this entry through the RSS 2.0 feed. You can leave a response, or trackback from your own site. Perfect love story for all involved! Hope to see em enjoying the lifestyle some day. Will be out there tentatively around April next year in the 48-60 “Volunteer” outa Knoxville TN.